While neglecting the blog, I’d largely kind of forgotten the 60before60 project. Oops. Only 3311 days to go according to my tracker. I’ve not really progressed anything much and honestly, the list probably needs some refinement. One thing I am actively doing is growing my hair after having it super-short for years. The beauty of this project is that it just kind of happens with little effort on my part. About a month ago it had sort of reached my neck (though there are bits that are just at my ears). 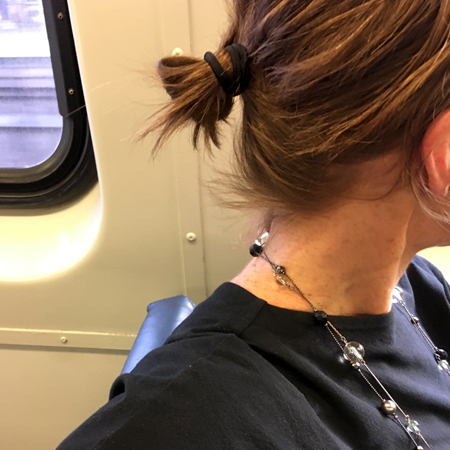 I was trying to do stuff with clips and tiny top knots to make it look half way respectable, but it had very little body and was kind of lifeless and flat – though fortunately shiny and in pretty good condition. So I decided there was nothing for it but to … get a perm! I chose a Japanese salon (which was lovely and comforting and very similar to being back in one of my favourite places) and spent a lovely few hours being cossetted. Sadly, my hair is “difficult” and the perm didn’t quite turn out as expected. There’s very little curl at all BUT it did give me some bounce and fullness which I am pretty delighted with. I think I am going to have to go to a full-on Western salon and have them bust out the very harsh chemicals if I want any curls at all. And yesterday I realised that I can finally put it up in a very tiny, somewhat messy ponytail! Progress! The other excellent thing is that for me, the longer hair is quite a lot less ageing than the very-short hair was becoming. While it was a look I could rock in my early-to-mid 40s, something about hitting the late 40s meant it just didn’t work anymore. Whether I last through a very hot and humid summer without lopping it off remains to be seem!